It was a night of sparkle at the 13th Annual SAG Awards with platinum leading the way yet again. That seems to be the metal of choice these days for any celebrity walking any red carpet, but hey, can you go wrong with platinum jewelry? I think not. JENNIFER HUDSON: Platinum earrings, bracelet and cocktail ring by Neil Lane . cate blanchett: Platinum earrings and necklace by Neil Lane . TERI HATCHER: Platinum and diamond cocktail ring by Kwiat. 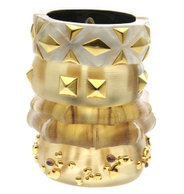 MARY LOUISE-PARKER: Platinum earrings, bracelets, and cocktail rings by Neil Lane . RACHEL MCADAMS: Platinum and diamond bracelet and earrings by Neil Lane . PATRICIA ARQUETTE: Platinum " Riviera " necklace, stud earrings, and cocktail ring by Neil Lane . MEGAN MULLALLY: Platinum and diamond earrings and cocktail ring by Neil Lane . CHANDRA WILSON: Platinum and diamond earrings and bracelet by Kwiat. SARA RAMIREZ: Platinum and diamond earrings and bracelet by Kwiat. PHYLLIS SMITH: Platinum earrings and bracelet by Neil Lane . KATE FLANNERY: Platinum bracelet, earrings and cocktail ring by Erica Courtney. JAMES SPADER: Platinum cufflinks and shirt studs by Neil Lane . CATT SADLER: Platinum earrings, necklace, bracelets and cocktail ring by Erica Courtney. BEN LYONS: Platinum "Crown Cross" cufflinks by Erica Courtney. What a list! Now for a few more glam shots. Valentine's Day traditionally is a day we women expect to see the goods – as in jewelry, candy, cards, and flowers. But what about your man? Should he be left out? I think not. But he is so darn hard to buy for. What do you get Mr. Right on the big V-Day? Luckily, Style Bakery has a few suggestions for us. First, no man should be without at least a few decent watches. 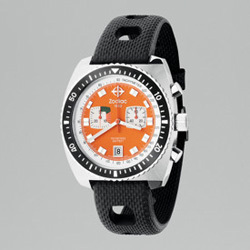 This sporty number is from the Zodiac Sea Dragon Collection and available at Saks. And these are great: Paul Smith flicker Heart Cuff Links Bold, multicolor heart flickers with movement. Even a not-so-simple key chain can show how much you care. You can find a lot more great ideas in a wide range of prices at Style Bakery. Often with beaded jewelry you can get a lot of bang for your buck. 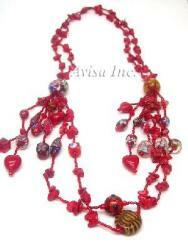 That is true with some of the bead finds on the Avisa Imports web site. They have loads of gemstone beaded jewelry at (pardon the pun) rock bottom prices. They call themselves a "wholesale to the public" company, and that usually means they import huge quantities of impulse purchase type items that enables them to sell at very low prices. Now, you aren't going to find one-of-a-kind original beaded jewelry designs here, but if you are looking to stock up on some fun fashion jewelry for yourself, or maybe you are a super early bird holiday shopper and need some stocking stuffers for the babysitter or your child's teachers, then this is also a place you may want to check out. One of the biggest jewelry gift-giving holidays of the year is coming up – Valentine's Day! Kenneth Fron knows that all too well and is a busy bead stringing jewelry designer as he prepares some of his beautiful one-of-a-kind necklaces in preparation for the big day. From Kenneth: With Valentine's Day approaching, I thought I would spotlight (2) very different one-of-a-kind necklaces for this Valentine's Day! For the old romantic type, there is the glamorous: "Marie Antoinette" necklace. Made with beautiful cream color vintage faux pearls and red and gold glass seed beads. This 59 inch piece can be worn once, twice or wrapped 3x for a layered look. 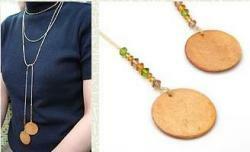 For the modern lady, there is the hip: "Funky Fresh" necklace. Silver chain links freely move and sway with attractive turquoise donut rings for a very now look.The necklace is 36 inches with a 3 inch drop. Both necklaces, when purchased arrive in luxurious satin-lined velvet necklace pouches, and come with a Product Registration Card & signed Certificate of Authenticity. 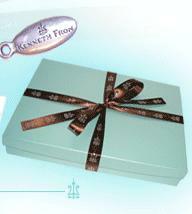 The attractive box and ribbon are also a no-brainer gift idea. Funky Fresh: NEW – 2007! (90) small and (74) medium size shiny silverplated non-hypoallergetic chain links (10) rare 1 inch round turquoise blue vintage donut rings. Really HIP and FRESH! Marie Antoinette: NEW – 2007! LUXURIOUS! (109) fabulous vintage white faux pearls, (10) round 14mm gold color ornate beads and over (100) metallic red and (200) gold seed beads. Wrap 2 or 3x. We start off this jewelry and fashion web snob round up with lots of metallic accessories, like these bracelets offered by FashionTribes. Dresses, florals, metallics & more…Fashiontribes has your Top 5 stylish spring must-haves! To Chanel or not to Chanel, Bag Snob ponders her role in the shopping habits of bag addicts. Koibox drama irks Blogdorf Goodman. Coquette follows Kate Moss as she moves from skinny to wide-leg jeans. New trend alert from our favorite fashionista? It's A SUITE LIFE PART II: Silver Spoon Is "Slammin' & Glammin" in the Hills–Beverly Hills! Fashiontribes' LA Story Golden Globe SWAG Bag Podcasts & Blogs!! At Papierblog, Eva ponders the meaning of Armani's net broadcasted Haute Couture show. Second City Style's Fall Fashion Preview and Predictions 2007/08: Truth, Beauty and Goodness on the Runway. StyleBakery.com delves "Underneath it All" to show us what to wear under this season's sexiest styles. "Television and style go hand in hand but have we lost our fashion role models?" asks Stylebites. Stylehive – From trash, comes treasure! Ashley Watson's Recycled Leather Bags are downtown-cool, eco-friendly bags fashioned from recycled leather clothing. Every year you ought to upgrade your arm candy. So consider hottie hunting for a new boy, and check KRiSTOPHER's 5 picks for the perfect bag. Trashionista Reviews Fashion at the 2007 Sundance Film Festival. eBeautyDaily tells you how to keep your lips kissably soft in the wintertime. Fendi Signature Zucca Dressed Monkey! eBelle5 located the Exclusive VIP Fendi Baby Milo. The Jewelry and Beading blog is in love with Venetian glass beads and uses them in a sterling bracelet and matching earring set. A friend of mine tipped me off to these wonderfully long wrapped necklaces from Korean Arts.com. You'll notice they don't have a clasp, no need to. They are designed to wrap multiple times around your neck or any other area of your body that you can get this thing around. This necklace pictured (left and below) is 81 inches long (206cm), so even I could get this thing around my waist a few times and wear it as a belt as well. The do-dads on the ends are a good idea, both practical as they probably keep this weighted down and pretty as they add a little something extra to the overall design. Here are a few more I found available on this site, which by the way, sells a lot of other unusual artistic items such as silk bags, bottles, and boxes. Even if you aren't a jewelry designer, for those who want to keep up with the latest color and design trends in jewelry, bookmark Fire Mountain Gem and Beads' Fashion Trends page. They keep this updated regularly with tips on future style trends and colors. 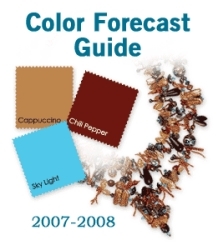 For example, the spring and summer 2007 color palette includes Chili pepper, mango, coral rose, lipstick red, and lime, just to name a few. If you have a color printer, you can print up a .pdf version of this page which they have linked, and then keep it for future reference. Combine sweet and refined romanticism with girlish charm and ethnic flavor to create a playful, free-spirited style that redefines the classics. Go ahead, break the rules! Unconventional is in and this season's recipe for style combines eccentricity with glamour and mixes a variety of bead shapes together. Imagine pearls, wood and metal all in the same piece. The essential ingredient of the season is plenty of soul! Color tones include antiqued pales, weathered denim, and crisp, bold brights. Contrast colors, textures, patterns, and prints for a modern take on traditional design. Finally, they have an "As Seen in Section," that show jewelry designs (such as these gorgeous gold colored earrings pictured) that you probably have spotted in magazines such as Lucky Magazine, WWD, and InStyle. Leonardo DiCaprio's latest film, Blood Diamond, has gotten the Oscar nod. He is up for best actor, and there are many other possible Oscars for this movie including best sound and editing. You can vote for your favorites right now on the Yahoo Movie site. He [Richard Foray ] and thousands of other small-scale miners in Sierra Leone fear that Hollywood's portrayal of their country's civil war could now rob them of their livelihoods. Blood Diamond, Leonardo DiCaprio's latest film, opens across Britain today, charting the trade in illegally-mined and sold gemstones during Sierra Leone's 11-year conflict, which ended in 2002. Bootleg copies of the film are already showing here, on flickering screens in tin-shack video halls. Few are impressed. "It's true that it shows the way things were during the war, but people here are so worried that others in the West will think that is the way it is now,"' said Mr Foray, 41, in Koidu, 210 miles northeast of Freetown. It is not. The people who are mining now are not the rebels; we are true miners trying to make money for feeding the family and school fees." Koidu, the capital of the country's Kono district, is Sierra Leone's diamond mining Heartland, peppered with craters excavated by hand by the town's 100,000 artisan miners. Beneath hills covered in coconut palms and along muddy riverbanks lie some of the richest diamond deposits in the world. Working mines already earn Sierra Leone more than Â£75 million a year. I've already blogged about one great jewelry show from the Chicago area: Treasures of the Titans, but there is lots more coming up in the next few weeks in the Chicago area for fashion and jewelry lovers. Ten A-list Fashion delights make this winter one of the chicest times of the year. The Jewelry Designer's Show features cutting-edge designs and tasty morsels at a jewel-box of a location. Other delights include historical looks at Dior and the dress of indigenous people, as well as shopping under-the-radar, trend tips and a morning with a retail icon's fashion staff. Maxim's sparkles for one special evening with Chicago jewelry designers. Find the ideal gift for your sweetheart among distinctive collections including: Alexis Drake Jewelry, Joann Lysiak, Stefani B. Distinctive Jewelry, Bourdage Pearls, Kathy Frey Sculptural Jewelry, Susanne Siegel Designs, Haji, Objets d'Envy, Tivi Wear, and more. Hors d'oeuvres and drinks included. 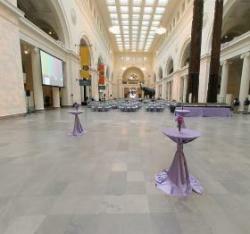 For information about other related fashion events, take a look at the Chicago Winter Delights web site. It's already started, but if you are in the Chicago area any time up until around early June, you can still take a look at some gorgeous fine jewelry and accessories at the Treasure of the Titans exhibit running now through June 3, 2007 at the Grainger Gallery — Second Floor of The Field Museum. General admission for the museum is $12 for adults, $7 for children 4-11, seniors and students with ID. Each piece reveals the character and style of the person associated with it. A stunning Bulgari diamond necklace and earrings set, for example, reflects the glamour of Italian actress Sophia Loren, who was the first person to win an Oscar for starring in a foreign film. Sir Elton John, known both for his musical hits and his outrageous sense of style, is represented by a three-inch-diameter brooch showing a globe made of gold, rubies and diamonds created to commemorate his 1989-90 world tour. Madeleine Albright, the first woman to serve as U.S. Secretary of State, wore an antique eagle brooch studded with rubies, diamonds and pearls during her 1997 swearing in ceremony. A striking diamond tiara, along with other accessories, illustrate the classic elegance of Princess Grace of Monaco, who first rose to fame as actress Grace Kelly in the 1950s.